OK, so I am on an Oreo and truffle binge lately. So sue me, but before you do, you might want to check these out. If you've got a package of Limeade Oreos in the pantry, bust them out. 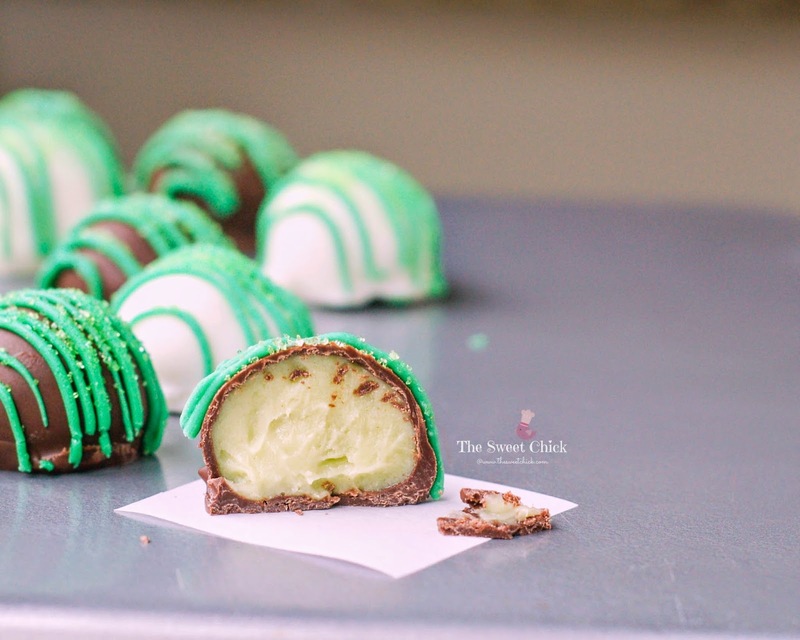 These Tequila Lime Oreo Truffles are worth the effort. I am still holding on hard to summer. I am not ready for pumpkins yet. I just pop one of these in my mouth, sit back, close my eyes and I can feel the warm sun and hear the ocean calling. 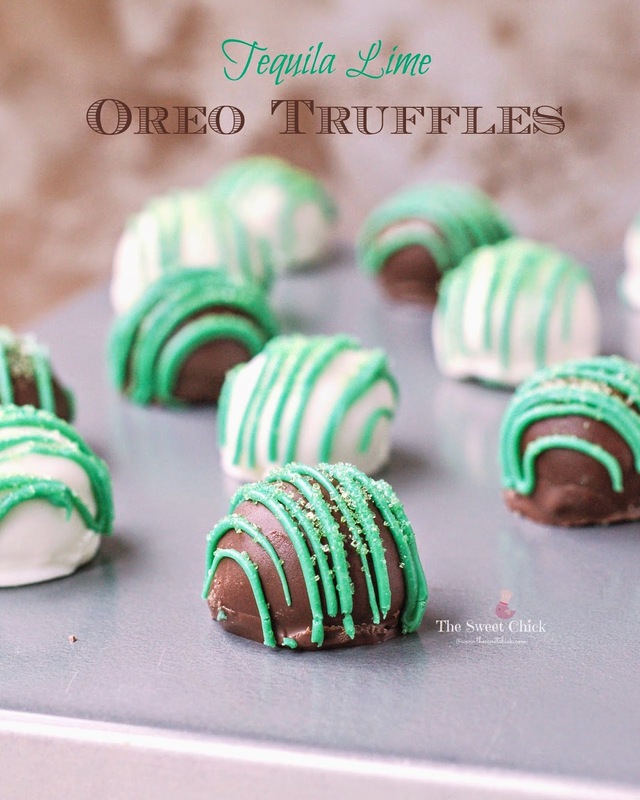 I tweaked the recipe I used for my Spike Lemon Oreo Truffles a bit to make these Tequila Lime Oreo Truffles. I added a little extra alcohol and since I didn't have white chocolate chips on hand, I used vanilla candy coating. But feel free to use the white chocolate chips if you like. I only used half the Oreo package to make these mini truffles. I ended up mixing the whole batter in my food processor, which in hindsight was a bit too messy. 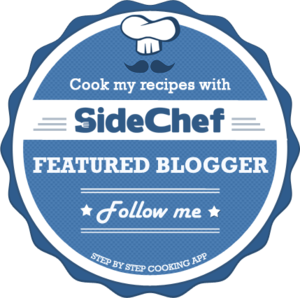 I suggest just mixing in a stand mixer or by hand. I think the food processor made the batter to thin. I ended up having to put it in the fridge for a bit to thicken up, before I scooped it. I finally bought a mini scoop. It worked perfect for these truffles, you can pop a whole one in your mouth and just enjoy all the flavors. I think I will use it for all my truffles from now on. I wanted to try a chocolate coating for these truffles, but just in case it didn't work out, I also used vanilla. I can't say which one I liked more. I took a poll from my husband and neighbors. Half liked it with vanilla and half liked it with chocolate. 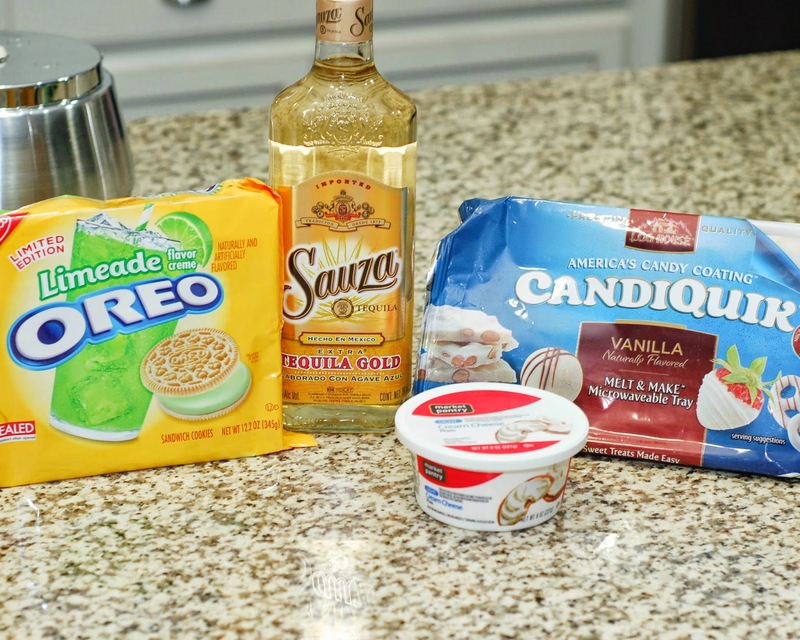 My husband says the chocolate enhanced the tequila flavor and the vanilla enhanced the lime flavor. I guess you'll just have to make them for yourself to see which tastes better. Just make sure you keep them away from the kids. Of course, after I made these I found the Wilton's coconut candy melt wafers. Next time I want to try those. If you really like tequila you should also try my Tequila Lime Coconut Fudge and Lime Coconut Rice Krispie Treats with tequila. 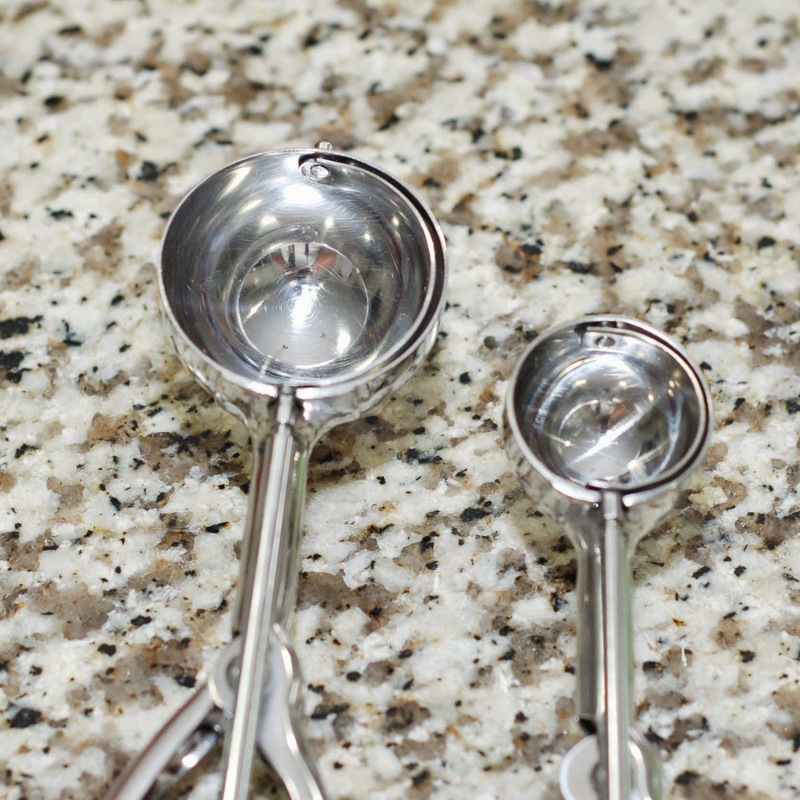 In a stand mixer or with a hand mixer, mix the tequila and the cream cheese until softened. Then add the crushed Oreos a little at a time until well incorporated. Melt the candy coating in a heat safe bowl in the microwave as per instructions on the package, until completely melted and smooth. Add the melted candy coating to the Oreo mixture and mix until it becomes a dough like consistency. After the balls are set, melt candy coating in the microwave as per directions on package. Do one color at a time. 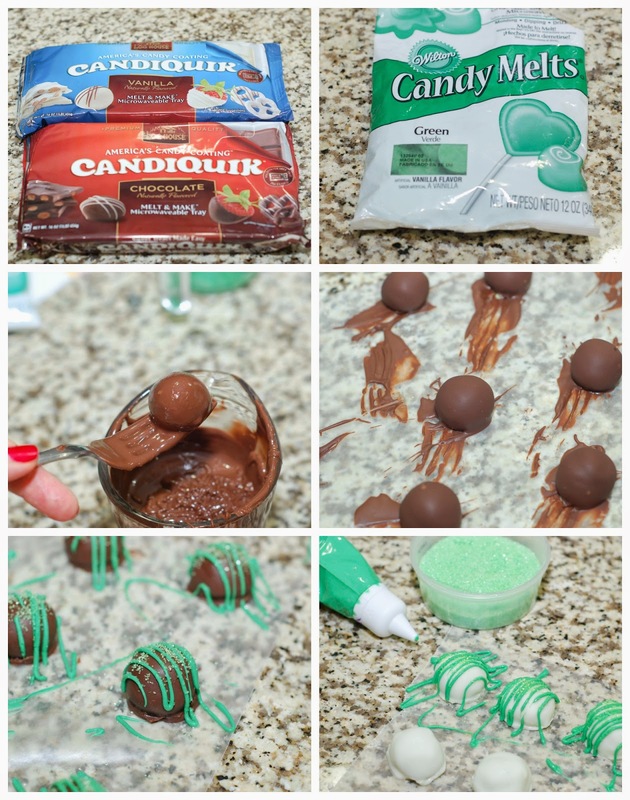 Dip the Oreo balls into candy coating mixture until all covered. (I use a fork.) Once covered, remove and softly tap until excess candy melt falls off. Then place the balls on wax paper until the candy melt hardens. Repeat for the other color. If you are adding just sprinkles , add them to the top of the balls before the candy melt hardens. 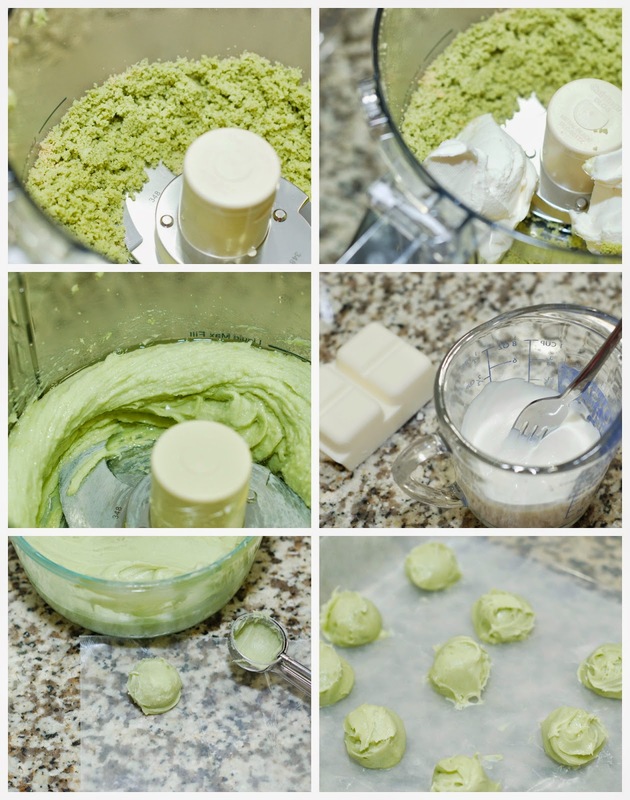 If you are decorating with green candy melt, wait until the other candy coating has hardened. Then drizzle on the green candy melt and add sprinkles.